Any previous versions of VZAccess® Manager must be uninstalled before proceeding. Refer to Uninstalling/Reinstalling VZAccess® Manager for assistance. Double click the VZAccess Manager installer package. 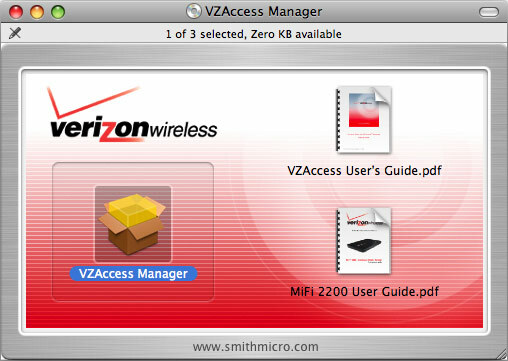 If Finder does not automatically open, navigate: Finder > VZAccess Manager CD. From the 'Welcome...' screen, click Continue. From the 'Important Information' screen, click Continue. Review the Software License Agreement then click Continue. To continue the installation, click Agree. If presented, select the appropriate destination drive (typically Macintosh Hard Drive) then click Continue. If prompted, enter the name and password used to log into the computer then click OK.
To create an alias on the Dock, ensure 'Install a VZAccess Manager icon in the Dock' is checked then click Continue.